Eddie Collins is recognized as one of today’s foremost instructors of the 5-string banjo, having authored numerous books designed to help all levels of players from beginner to advanced. He was the founder/editor of the highly regarded 5-String Quarterly, a trade publication dedicated to all aspects of the 5-string banjo. Eddie currently authors the “Beginner’s Corner” column for Banjo NewsLetter. As a features writer for numerous acoustic music publications, he has interviewed many of today’s top banjo players – gaining key insights into their playing styles. Collins resides in Austin, TX, where he teaches music and performs with some of the finest musicians in Texas. 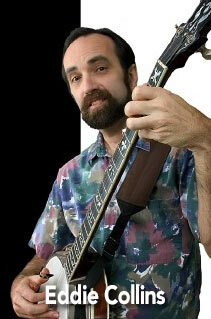 He has numerous recording credits, including his latest all-instrumental solo project, Rapid Transit (2008). Eddie holds a Master’s degree in education and formerly taught teacher education courses at California Lutheran University. Also an accomplished guitar and mandolin player/instructor, he has performed and conducted workshops throughout the United States and Europe. Eddie’s career and original music have been documented in several publications and were highlighted on the nationally-syndicated television show, Texas Music Café.